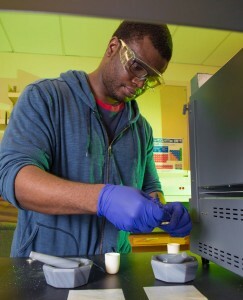 Illinois State senior Subomi Aregbesola loves working in a lab and hopes to find a job with a pharmaceutical company. Subomi Aregbesola’s past is pretty remarkable. But it’s his future that may be the real story. The Illinois State University senior was born in Nigeria but moved to the U.S. in 2001 at age 10 after his family won the coveted visa lottery. Aregbesola won his U.S. citizenship just this semester and is now weeks away from graduating, eager to pursue a career in pharmaceuticals research and development. That passion for science traces back to Aregbesola’s childhood in Lagos, Nigeria. His father moved to the U.S. in 1997, laying roots outside Chicago for the rest of the family. Back in Nigeria, Aregbesola’s mother was making him and his older siblings speak English at home to get ready for the move themselves. That day finally came four years later, in 2001. Preparing to leave at the U.S. Embassy in Nigeria, Aregbesola saw a white person for first time—one of many “firsts” he would encounter in the years to come. Aregbesola and his two siblings arrived in the middle of the night in August 2001 at O’Hare International Airport. He was surprised to see so much traffic on the roads and, even more shocking, all the lights on. Aregbesola then began his American life in his family’s Schaumburg apartment—a big change from his childhood home on a farm with lots of land. He started sixth grade, but despite honing his English with help from movies like Rush Hour and The Matrix, he was moved to an English as a Second Language (ESL) school. Aregbesola is a biochemistry major with a minor in chemistry and biology. But by the next year, Aregbesola was settling in, making friends, even feeling American. He graduated high school early, at age 16, and enrolled at Illinois State in 2011 after attending community college. Specific moments from his childhood inspired his interest in science. In Nigeria they’d play soccer after church, and he’d marvel at how Mother Nature could make it sunny on the field, but raining just 100 feet away. And during those power outages, he’d look up at the bright stars with big questions. For the past year the biochemistry major has worked as an undergraduate assistant doing solid-state chemistry with Eirin Sullivan, an assistant professor of inorganic chemistry at Illinois State. He loves working in a lab and hopes to find a job with a pharmaceutical company after graduating in May. “I love the campus. I love everything I’ve been blessed to be able to do at ISU,” he said. Aregbesola has left quite an impression on Ally Cherveny, his academic advisor in the Department of Chemistry. He’s soft-spoken and thoughtful, Cherveny says, and the way he tells stories about life in Nigeria—capturing the beauty in simple joys and small moments—is remarkable. Aregbesola’s parents still live in Schaumburg; his father now owns a shipping company and continues to serve as a minister, and his mother is a social worker. His older siblings have already graduated college. His parents still return to Nigeria once a year, and Aregbesola’s new U.S. citizenship will make it easier for him to travel there himself. He plans to make a trek sometime in 2015. “My cultural background … it’s something I don’t want to forget,” he said.